The thought of booking an all-inclusive holiday is becoming an increasingly popular among holiday-makers and it is easy to see why with sumptuous dining options, child-friendly amenities and excellent service included. We have previously written a guide to booking all inclusive hotels and holidays so for some inspiration we’ve listed our top luxury all inclusive holidays for summer below. Located close to a wide sandy beach and Lagos Marina the four-star Vila Gale Lagos is an excellent choice for those looking for a luxury holiday to the Algarve. If you don’t fancy the beach there is a large outdoor pool surrounded by sun loungers serviced by a poolside bar make for relaxing days in the sun. For those wanting to be active there are numerous sports facilities and a gym for the more active and the tranquil Satsanga Spa for those who don’t. Children are sure to be kept busy and entertained at their own club, pool and playground. The hotel boasts excellent dining choices including the main buffet Versatil Restaurant, a la carte Inevitavel restaurant and two bars including the Pool bar which is open daily serving drinks and snacks. With direct access to the beach the five-star Iberostar Hotel Anthelia in Costa Adeje is a fantastic choice of hotel for both adults and children. Relax by one of the pools, wander through the gardens or stroll across Playa Fanabe beach. There are four restaurants and pool bar serving snacks for you to enjoy. The main Zeus Restaurant serves buffet breakfasts then local and international cuisine in the evenings and theme nights. For something special visit Poseidon Gourmet restaurant and sample local Canarian cuisine. For light snacks during the day, visit the Barito Pool Bar and Zumeria Pool snack bar. The all-suite, adults-only five-star Constantinou Bros. Asimina Suites Hotel is especially for those looking for a stylish and luxurious all inclusive holiday. In a tranquil area of Paphos you can relax by either of the outdoor, fresh water swimming pools, indulge in a spa treatment or soak up the sun on the sandy beach. Guests can now stay on an all inclusive basis at the exceptional hotel with the Deluxe Package at Constantinou Bros Asimina Suites Hotel. With this exclusive package guests can choose to dine at either of the four a la carte restaurants each night as well as receiving a full English buffet breakfast in the mornings and a la carte lunch service at the Pool restaurant. 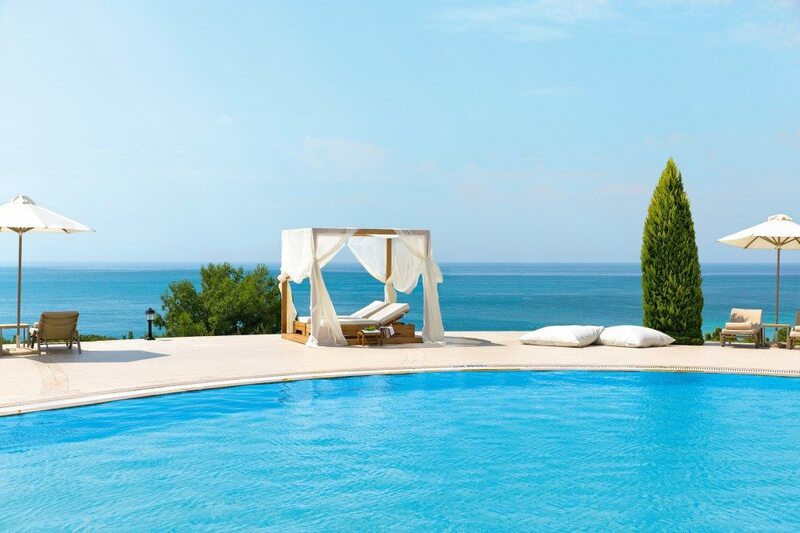 Another hotel brilliant for beach lovers this summer is the five-star Ikos Oceania. This modern, all-inclusive resort offers great facilities in a picturesque setting surrounded by olive groves, cypress trees just up from a gorgeous shingle beach. The hotel boasts an exclusive infinity pool equipped with comfy loungers, while for younger guests there are clubs, their own private swimming pool and playgrounds. With a variety of dining options across five fantastic restaurants including a selection of Italian, French, Asian and traditional Greek a la carte there is something for everyone and for any taste. Who could resist glorious sunshine, pink sandy beaches and azure waters? Not many – which is why we can’t help but recommend the fantastic destination of Bermuda. Rooms at the Grotto Bay Beach Resort feature private balconies or patio with unrivalled ocean view or front views. Thanks to the onsite freshwater pool, jacuzzi, watersports centre and scuba diving shop, you’ll never be short of inspiration on what to do next. Uniquely, the hotel boasts the unusual feature of two 500,000 year-old underground caves complete with stalagmites and stalactites which guests are free to swim and explore! Restaurants include Palm Court, offering local Bermudan flavours, the Hibiscus room offering fine dining and the Bayside Bar and Grill with its superb theme nights. See anything you like? Do not hesitate to call our expert reservation team on freephone 0800 047 1066 or visit our website to see our full range of 4 and 5 star all-inclusive holidays. What is and is not included in all-inclusive packages varies from hotel to hotel so we always recommend checking what forms part of the package before you book.